When your home’s exterior starts looking dingy due to algae build up on the siding, it looks unpleasant. Your property value decreases. To clean and restore your home’s beauty, call us to pressure wash your house. Improve your curb appeal 100 percent by washing away grime and dullness. Replace the dirt and grime with a fresh and clean looking surface. 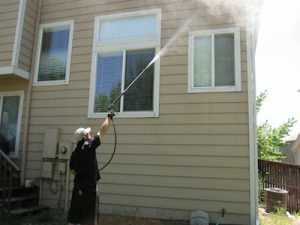 Removing discoloration and contaminants from the exterior of your home creates a healthier environment for your family. Without a huge investment, you can improve your home’s exterior. Our environmentally safe cleaning solutions are just right for cleaning all types of exterior surfaces. We can clean brick, vinyl, aluminum, wood, composite materials, stucco, and more. In addition, our cleaning solutions prevent the contaminants from returning for a long time. Our power washing service achieves effective results. We have expedient and expert service. When you call us, we work our hardest to meet and exceed your expectations. If you need us in a hurry, we can be there the same day or the next day. Our rates are reasonable and we provide a no-obligation free written estimate. We stand behind our satisfaction guarantee. Call us today; you will be glad that you did. Your home deserves a clean exterior that you can proudly show off to your family and friends. You will be the envy of the neighborhood. We appreciate your business. Let us show you how we can restore your home’s beauty today. We offer seasonal rates and a satisfaction guarantee.